A canoe is a small, narrow boat, typically human-powered, but it may also have a sail. Canoes are pointed at both ends and usually open on top, but can be covered. In its human-powered form, the canoe is propelled by the use of paddles, with the number of paddlers depending on the size of the canoe—most commonly two. Paddlers face in the direction of travel, either seated on supports in the hull, or kneeling directly on the hull. In this way, paddling a canoe can be contrasted with rowing, where the rowers face away from the direction of travel. Paddles may be single-bladed or double-bladed. Sailing canoes are propelled by any of a variety of sailing rigs. Common classes of modern sailing canoes include the 5m² and the international 10m² sailing canoes. The latter, otherwise known as the International Canoe, is one of the fastest and oldest competitively sailed boat classes in the western world. The sport of canoeing, organized at the international level by the International Canoe Federation, uses the word canoe to cover both canoes as defined here, and kayaks (see below for a brief description of the differences between a kayak and a canoe). In fact, the sport of canoe polo is exclusively played in kayaks. The first use of the word canoe by a European, originally from the Arawak word "canoa" in the Caribbean Sea, was by Christopher Columbus. Later Garcilaso de la Vega defined it as an open boat, but the British used it for all boats of the Indigenous peoples of the Americas. This use of canoe to generically cover both canoes and kayaks is not so common in North American usage, but is common in Britain, Australia and presumably many parts of the world, both in sporting jargon and in colloquial speech. In these circumstances, the canoe as defined here is sometimes referred to as an open, Canadian, or Indian canoe, though these terms have their own ambiguities. A 'canoe' in this ambiguous sense is a paddled vessel in which the user faces the direction of travel. Yoke - a thwart across the centre of the boat to allow one person to carry the canoe, and is sometimes molded to the shape of the shoulders. The portion of the hull between the waterline and the top of the gunwale is called freeboard. Early canoes were wooden, often simply hollowed-out tree trunks. Hot coals were used to burn the wood, to make scraping out the hollow quicker and easier. This technology is still practiced in some parts of the world. Modern wooden canoes are typically strip-built by woodworking craftsmen. Such canoes can be very functional, lightweight, and strong, and are frequently quite beautiful works of art. Many indigenous peoples of the Americas built canoes of tree bark, from species like spruce and birch, which peels off in long supple strips. It can be laced and sewn with vines and tree roots and sealed with pine resin. The indigenous people of the Amazon commonly used Hymenaea trees. In temperate North America, cedar was used for the frame and Birch bark for the hull, with charcoal and fats mixed into the resin. Modern technology has expanded the range of materials available for canoe construction. Wood-and-canvas canoes are made by fastening an external canvas shell to a wooden hull formed with cedar planks and ribs. These canoes evolved from birch bark construction but the transition record is not clear. In areas where birch bark was scarce, other natural materials such as cedar had to be used and there was known success in patching birch bark canoes with canvas or cloth because these materials were readily available. Efforts were made in various locations to improve upon the bark design such as in Peterborough, Ontario, Canada where rib and plank construction was used by the Peterborough Canoe Company, and in Old Town, Maine in the U.S where similar construction was used by the Old Town Canoe Company. Maine was the location of the development of commercial wood-and-canvas canoes. E. H. Gerrish, of Bangor, is now recognized as the first person to produce wood-and-canvas canoes commercially, but other Maine builders soon followed, including, B. N. Morris, of Veazie, E. M. White, of Old Town, and, of course, the Gray family of the Old Town Canoe Co.
Aluminum canoes were first made by the Grumman company in 1944, when demand for airplanes for World War II began to drop off. Aluminum allowed a lighter and much stronger construction than contemporary wood technology. However, a capsized aluminium canoe will sink unless the ends are filled with flotation blocks. Plywood canoes are sealed with epoxy resin, or the inferior but cheaper polyester resin, and reinforced with glass fibre tape or cloth. Composites of fiberglass, Kevlar and carbon fiber are used for modern canoe construction. These compounds are light and strong, and the maneuverable, easily portaged canoes allow experienced paddlers access to some of the most remote wilderness areas. Royalex is another modern composite material that makes an extremely flexible and durable hull suitable, in particular, for whitewater canoes. Royalex canoes have been known to pop back into their original shape with minimal creasing of the hull after having been wrapped around a rock in strong river currents. Polyethylene is a cheaper and heavier material used for modern canoe construction. Graphite canoes are the lightest boats on the market and tend to be 3-6 pounds lighter than a kevlar boat. Because graphite lacks the impact and abrasion resistance of other composite materials, graphite boats are used almost exclusively by flatwater canoeists. Depending on the intended use of a canoe, the various kinds have different advantages. For example, a canvas canoe is more fragile than an aluminum canoe, and thus less suitable for use in rough water; but it is quieter, and so better for observing wildlife. However, canoes made of natural materials require regular maintenance, and are lacking in durability. Many canoes are symmetrical about the centerline, meaning their shape can be mirrored along the center. When trimmed level (rarely the case) they should handle the same whether paddling forward or backward. Many modern designs are asymmetrical, usually having the widest beam slightly farther aft which improves efficiency and promotes more level fore and aft trim. A further improvement may be found in canoes with a straighter hull profile aft and rocker forward which improves tracking. A traditionally shaped canoe, like a voyageur canoe, will have a tall rounded bow and stern. Although tall ends tend to catch the wind, they serve the purpose of shedding waves in rough whitewater or ocean travel. The shape of the hull's cross section significantly influences the canoe's stability under differing conditions. Flat-bottomed canoes generally have excellent initial stability, which diminishes rapidly with increased heel. Their high initial stability causes them to have a more abrupt motion in waves from the side. For a given beam, a rounded-bottom canoe will have less initial stability than its flatter bottomed cousin. Round sections have lower surface area for a given volume and have less resistance through the water. They are most often associated with racing canoes. In between the flat and rounded bottom are the more common shallow-arc and "V" bottom canoes which provide a compromise between performance and stability. The shallow-vee bottom, where the hull centerline forms a ridge like a shallow "V," will behave similar to a shallow-arc bottom but its volume to surface ratio is worse. Similar is the tumblehome hull which has the top potion of the hull curving back in slightly. Many modern canoes combine a variety of cross sections to suit the canoe's purpose. Keels on canoes improve directional stability (the ability to 'track' in a straight line) but decrease the ability to turn quickly. Consequently, they are better suited for lake travel, especially when traveling on open water with crosswinds. Conversely, keels and "Vee"-bottoms are undesirable for whitewater because often quick turns are required. In aluminum canoes, small keels occur as manufacturing artifacts when the two halves of the hull are joined. In wood-and-canvas canoes, keels are rub-strips to protect the boat from rocks and as they are pulled up on shore. Plastic canoes feature keels to stiffen the hull and allow internal tubular framing to lie flush with the sole of the canoe. Curvature of the hull profile that rises up at the bow and stern is called "rocker." Increasing the rocker improves maneuverability at the expense of tracking. Specialized canoes for whitewater play have an extreme rocker and therefore allow quick turns and tricks. Rocker also has an immense effect on the stability of a Canadian canoe. By lifting the ends of the craft out of the water, rocker puts more of the wider centre section of the boat into the water, contributing significantly to the overall stability of the craft. 35mm rocker at each end makes all the difference to how safe a novice will feel in a canoe. Modern cedar-strip canoes have gunwales which consist of inner and outer parts called "inwales" and "outwales." These two parts of the gunwale give rigidity and strength to the hull. The inwale will often have "scuppers" or slots cut into the inwale to allow water to drain when the canoe hull is turned upside down for storing. In the past, people around the world have built very different kinds of canoes, ranging from simple dugouts to large outrigger varieties. More recently, technologically advanced designs have emerged for particular sports. Dugout - formed of hollowed logs; may have outriggers in some cultures. On the west coast of North America, large dugout canoes were used in the Pacific Ocean, even for whaling. Birch-bark canoe - in the temperate regions of eastern North America, canoes were traditionally made of a wooden frame covered with bark of a birch tree, pitched to make it waterproof. Voyageur canoe - traditional voyageur canoes were similar to birch-bark canoes but larger and purpose built for the fur trade business, capable of carrying 12 to 20 passengers and 3000 pounds of cargo. Canvas canoe - similar to the birch-bark canoe in frame construction and size but covered with canvas, and painted for smoothness and watertightness. Modern canoe types are usually categorized by the intended use. 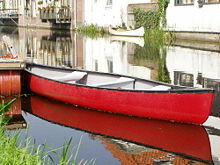 Many modern canoe designs are hybrids (a combination of two or more designs, meant for multiple uses). The purpose of the canoe will also often determine the materials used. Most canoes are designed for either one person (solo) or two persons (tandem), but some are designed for more than two persons. Touring canoe (or tripping canoe) - made of lighter materials and built for comfort and cargo space; usually a more traditional design. Prospector canoe - a popular type of touring canoe marked by a symmetrical hull and a continuous arc from bow to stern; made in a variety of materials. Long Distance Touring canoe - A cockpit has many unique advantages. The main one is being able to make the gunnel line lower and narrower so the paddler can reach the water better. At the same time a cockpit makes the rim of the boat higher and therefore the boat is dryer. With the rounded hull shape and full ends there is nothing for turbulent water to work on. Whitewater canoe (or river canoe) - typically made of tough man-made materials, such as ABS, for strength; no keel and increased rocker for maneuverability; often extra internal lashing points are present to secure floatation bags, harness, and spraydeck. Some canoes are decked and look very much like a kayak, but are still paddled with the paddler in a kneeling position and with a single bladed paddle. Playboating open canoe - a subgroup of whitewater canoes specialized for whitewater play and tricks or for competitive whitewater slalom. Some of these canoes are short in length and have such extreme rocker that they are also known as banana boats. Square stern canoe - asymmetrical canoe with a squared off stern for the mounting of an outboard motor; meant for lake travel or fishing. Racing canoe (or sprint canoe) - purpose-built racing canoe for use in racing on flat water. To reduce drag, they are built long and with a narrow beam, which makes them very unstable. A one-person sprint canoe is 5.2 meters or 17 feet long. Sprint canoes are paddled kneeling on one knee, and only paddled on one side; in a C-1, the canoeist will have to j-stroke constantly to maintain a straight course. Marathon canoe races use a similar narrow boat. Inflatable canoe - similar in construction and materials to other inflatable boats but shaped like a canoe; meant for serious whitewater; usually difficult to use for flatwater travel. Kayak - The main difference between a kayak and a canoe is that a kayak is a closed canoe meant to be used with a double-bladed paddle, one blade on each end, instead of a single bladed paddle. The double-bladed paddle makes it easier for a single person to handle a kayak. Kayaks are more commonly enclosed on top with a deck, making it possible to recover from a capsize without the kayak filling with water in most cases, although there are also closed canoes, which are common in competition. The deck is an extension of the hull, with a special sheet called a spraydeck sealing the gap between deck and the paddler. Rowboat - Not considered a canoe. It is propelled by oars resting in pivots on the gunwales or on 'riggers' that extend out from the boat. A rower may use one (sweep-oar)or two oars (sculling). A rower sits with his or her back toward the direction of travel. Some rowboats, such as a River Dory or a raft outfitted with a rowing frame are suitable for whitewater. Adirondack guideboat - a rowboat that has similar lines to a canoe. However the rower sits closer to the bilge and uses a set of pinned oars to propel the boat. Dragon boat - while it handles similar to and is paddled the same way as a large canoe, a dragon boat is not considered a canoe since its construction is markedly different. Sit-on-tops - more akin to kayaks in design, handling, and propulsion (see Kayak#Sit-on-tops). Canoes have a reputation for instability, but this is not true if they are handled properly. For example, the occupants need to keep their center of gravity as low as possible. Canoes can navigate swift-moving water with careful scouting of rapids and good communication between the paddlers. When two people occupy a canoe, they paddle on opposite sides. For example, the person in the bow (the bowman) might hold the paddle on the port side, with the left hand just above the blade and the right hand at the top end of the paddle. The left hand acts mostly as a pivot and the right arm supplies most of the power. Conversely, the sternman would paddle to starboard, with the right hand just above the blade and the left hand at the top. For travel straight ahead, they draw the paddle from bow to stern, in a straight line parallel to the gunwale. A trick called "gunwale bobbing" or "gunwaling" allows a canoe to be propelled without a paddle. The canoeist stands on the gunwales, near the bow or the stern, and squats up and down to make the canoe rock backward and forward. This propulsion method is inefficient and unstable; additionally, standing on the gunwales can be dangerous. However, this can be turned into a game where two people stand one on each end, and attempt to cause the other to lose balance and fall into the water, while remaining standing themselves. The paddling action of two paddlers will tend to turn the canoe toward the side opposite that on which the sternman is paddling. Thus, steering is very important, particularly because canoes have flat-bottomed hulls and are very responsive to turning actions. Steering techniques vary widely, even as to the basic question of which paddler should be responsible for steering. Among experienced white water canoeists, the sternman is primarily responsible for steering the canoe, with the exception of two cases. The bowman will steer when avoiding rocks and other obstacles that the sternman cannot see. Also, in the case of backferrying, the bowman is responsible for steering the canoe using small correctional strokes while backpaddling with the sternman. Among less-experienced canoeists, the canoe is typically steered from the bow. The advantage of steering in the bow is that the bowman can change sides more easily than the sternman. Steering in the bow is initially more intuitive than steering in the stern, because to steer to starboard, the stern must actually move to port. On the other hand, the paddler who does not steer usually produces the most forward power or thrust, and the greater source of thrust should be placed in the bow for greater steering stability. The cruising stroke or forward stroke is the easiest stroke and is considered to be the foundation of all the other strokes. It is used mainly by the bowman to simply propel the canoe forward without turning. The paddle blade is brought forward along the side of the canoe, dipped into the water, and drawn back. The paddle should be drawn straight back rather than following the gunwale's curvature. The back stroke is essentially the same movement, but done in reverse. The back face of the blade is used in this case. This stroke is used to make the canoe go backward or to stop the canoe. Advocates of steering in the stern often use the J-stroke, which is so named because, when done on the port side, it resembles the letter J. It begins like a standard stroke, but towards the end, the paddle is rotated and pushed away from the canoe with the power face of the paddle remaining the same throughout the stroke. This conveniently counteracts the natural tendency of the canoe to steer away from the side of the sternman's paddle. This stroke is used in reverse by the bowman while backpaddling or backferrying in white water. A less elegant but more effective stroke which is used in the stern is the Superior stroke, more commonly referred to as the goon or rudder stroke. Unlike the J-stroke in which the side of the paddle pushing against the water during the stroke (the power face) is the side which is used to straighten the canoe, this stroke uses the opposite face of the paddle to make the steering motion. It is somewhat like a stroke with a small pry at the end of it. This stroke uses larger muscle groups, is preferable in rough water and is the one used in white water. It is commonly thought to be less efficient than the J-stroke when paddling long distances across relatively calm water. Another stroke which may be used by either the bow or stern paddler is the pry stroke. The paddle is inserted vertically in the water, with the power face outward, and the shaft braced against the gunwale. A gentle prying motion is applied, forcing the canoe in the opposite direction of the paddling side. The push-away stroke has an identical purpose to the pry stroke, but is performed differently. Instead of bracing the paddle against the gunwale, the paddle is held vertically, as in the draw stroke, and pushed away from the hull. This is more awkward and requires more force than the pry, but has the advantage of preventing damage to the paddle and canoe due to rubbing on the gunwale. It also uses force more efficiently, since the paddle is pushing straight out, instead of up and out. The running pry can be applied while the canoe is moving. As in the standard pry, the paddle is turned sideways and braced against the gunwale, but rather than forcing the paddle away from the hull, the paddler simply turns it at an angle and allows the motion of the water to provide the force. The draw stroke exerts a force opposite to that of the pry. The paddle is inserted vertically in the water at arm's length from the gunwale, with the power face toward the canoe, and is then pulled inward to the paddler's hip. A draw can be applied while moving to create a running or hanging draw. For maximum efficiency, if multiple draw strokes are required, the paddle can be turned 90° and sliced through the water away from the boat between strokes. This prevents the paddler from having to lift the paddle out of the water and replace it for each stroke. The scull, also known as a sculling draw is a more efficient and effective stroke where multiple draw strokes are required. Instead of performing repeated draw strokes, the paddle is "sculled" back and forth through the water. Beginning slightly in front of the paddler, the paddle is angled so that the power face points at a 45° angle toward the hull and astern. The paddle is drawn straight backward, maintaining the angle, and then the angle is rotated so that the power face is pointing 45° toward the hull and the bow. The paddle is pushed straight forward, and the whole process is repeated. The net effect is that the paddler's end of the canoe is drawn toward the paddling side. The reverse scull (sometimes sculling pry or sculling push-away) is the opposite of the scull. The stroke is identical, but with the paddle angles reversed. The net effect is that the paddler's end of the canoe is pushed away from the paddling side. The cross-draw stroke is a bowman's stroke that exerts the same vector of force as a pry, by moving the blade of the paddle to the other side of the canoe without moving the paddler's hands. The arm of bottom hand crosses in front of the bowman's body to insert the paddle in the water on the opposite side of the canoe some distance from the gunwale, facing towards the canoe, and is then pulled inward while the top hand pushes outward. The cross-draw is much stronger than the draw stroke. The sweep is unique in that it steers the canoe away from the paddle regardless of which end of the canoe it is performed in. The paddle is inserted in the water some distance from the gunwale, facing forward, and is drawn backward in a wide sweeping motion. The paddler's bottom hand is choked up to extend the reach of the paddle. In the case of the bowman, the blade will pull a quarter-circle from the bow to the paddler's waist. If in the stern, the paddler pulls from the waist to the stern of the canoe. Backsweeps are the same stroke done in reverse. Complementary strokes are selected by the bow and stern paddlers in order to safely and quickly steer the canoe. It is important that the paddlers remain in unison, particularly in white water, in order to keep the boat stable and to maximize efficiency. There are some differences in techniques in how the above strokes are utilized. One of these techniques involves locking or nearly locking the elbow, that is on the side of the canoe the paddle is, to minimize muscular usage of that arm to increase endurance. Another benefit of this technique is that along with using less muscle you gain longer strokes which results in an increase of the power to stroke ratio. This is generally used more with the 'stay on one side' method of paddling. The other technique is generally what newer canoeists use and that is where they bend the elbow to pull the paddle out of the water before they have finished the stroke. This is generally used more with the 'switch sides often' method of paddling. The stay on one side method is where each canoeist takes opposite sides and the sternman uses occasional J-strokes to correct direction of travel. The side chosen is usually the paddlers' stronger side, since this is more comfortable and less tiring. Some canoeists do, however, switch sides after twenty to thirty minutes or longer as a means of lessening muscle fatigue. The switch sides often method (also called hit and switch, hut stroke, or Minnesota switch) allows the canoeists to switch sides frequently (usually every 5 to 10 strokes, on a vocal signal, commonly "hut") to maintain their heading. This method is the fastest one on flat water and is used by all marathon canoeists in the US and Canada. The method works well with bent-shaft paddles. Racer/designer Eugene Jensen is credited with the development of both "hit and switch" paddling and the bent shaft paddle. On swift rivers, the sternman may use a setting pole. It allows the canoe to move through water too shallow for a paddle to create thrust, or against a current too quick for the paddlers to make headway. With skillful use of eddies, a setting pole can propel a canoe even against moderate (class III) rapids. War canoes coming across the line at the 2005 Canadian Canoe Championships. Front profile of woodstrip canoe under construction. Mason, Paul (1999}. Thrill of the Paddle: The Art of Whitewater Canoeing. Ontario, Canada: Firefly Books. ISBN 1552094510. This page was last modified on 7 January 2017, at 16:37.